The Vignelli Collection is a new classic. It is a multi-purpose grouping and with its gentle curves and selective colors it is ideal for all types of indoor and outdoor environments. A new classic. The Vignelli Collection has gentle curves and moulded body which offers timeless elegance, simplicity and functionality. Made of UV- and weather-resistant resin. It's perfect for restaurants, lounges, patios and dining rooms. The Cube, Big Bench, and Low Table is appropriate for indoor and outdoor commercial, institutional and residential use. It comes in 3 great colors; white, dark grey, and light grey. 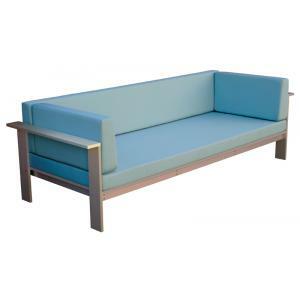 Vignelli Cube: Height: 18 1/8", Width: 18 1/8", Depth: 18 1/8"
Vignelli Big Bench: Height: 18 1/8", Width: 71 5/8", Depth: 18 1/8"
Vignelli Low Table: Height: 18 1/8", Width: 47 1/4", Depth: 47 1/4"